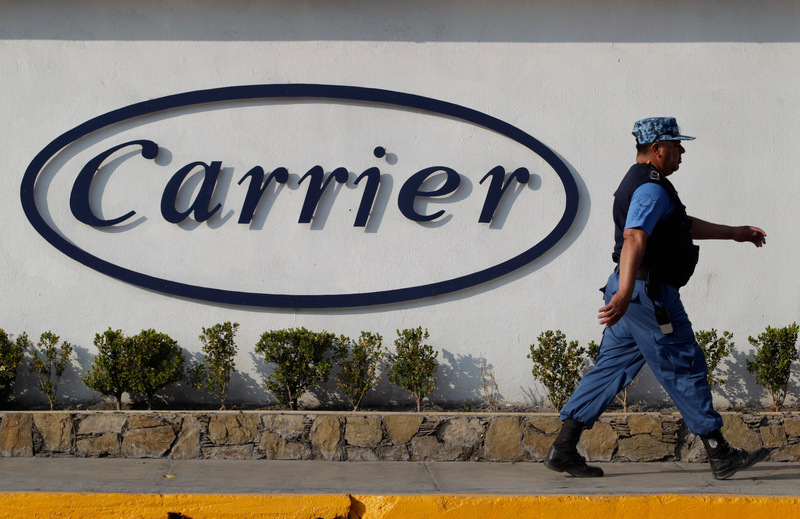 A private security guard walks past a logo of Carrier Corp outside the air conditioner plant, a unit of United Technologies Corp, in Santa Catarina, on the outskirts of Monterrey, Mexico, February 17, 2016. United Technologies said after stock markets closed on Nov. 26 that it would separate into three companies. The conglomerate also said it had completed its $23 billion acquisition of aerospace firm Rockwell Collins. The three companies will focus on aerospace, elevators and building products and take the names United Technologies, Otis and Carrier respectively. Shareholders will receive stock in Otis and Carrier in a tax-free spinoff. Activist hedge funds Third Point and Pershing Square Capital Management had put pressure on United Technologies to split, and the company had said repeatedly over the past year that it was considering the move. Gregory Hayes will continue to be chairman and chief executive of United Technologies following the split, which is expected to be completed by 2020.